Version 2019T1 contains new tools for basic and production design and many additions to support users in everyday tasks. Significant time savings can be achieved in the initial project stages by reusing previous diagrams or part diagrams. In version 2019T1, it is possible to copy any part or a complete diagram and reuse it for a new project. The improved functionality allows the user to export and import diagram parts. When importing to a new location, it is possible to generate new position IDs, change systems and pipelines or edit a single object, such as assigning a different type of valve or actuator. Import and export any part of the diagram between different projects or diagrams. Design managers can extract data for project status and follow the progress using various metrics. The Follow-up functionality extracts the main characteristics of the diagram, such as the number of routed pipelines or armatures and equipment and allows comparison with the respective data in the 3D model. Follow project progress statistics related to Diagram and 3D model object changes at selected time intervals. Follow-up reports are customizable and can be used for visualization of KPI in project follow-up. As part of the continuous drive to add functionality and enhance the user experience, the new version has several features to make everyday tasks simpler. It is now possible to move custom symbols. Additional assistance when joining lines for easy selection lines. New piperun diagram labels are automatically vertical when selected piperun point is vertical. 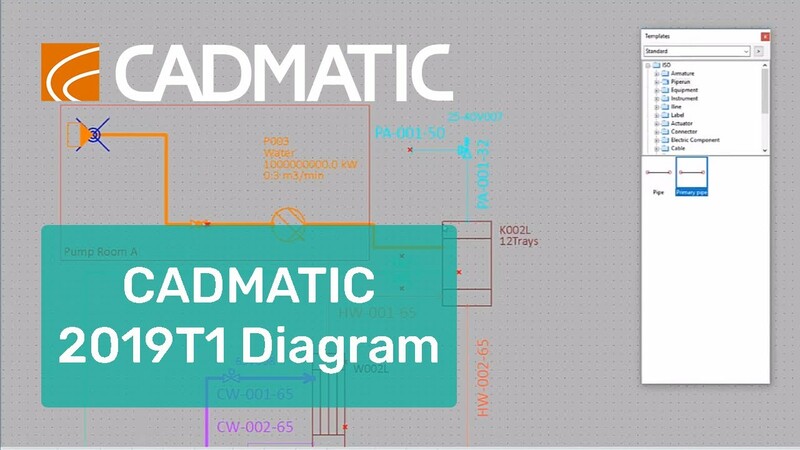 Users can benefit significantly from using the full scope of CADMATIC products. Integrating all project related data using eShare, has additional benefits for Diagram users. In version 2019T1, it is possible to load object data to Diagram from eShare, even if the object does not exist yet in the 3D model. This enables the use of data for Diagram sourcing from calculations, basic design, or supplier data. Example of data loaded from Excel file in eShare to Diagram object. The new tool for spool generation enables the generation and automatic annotation of spool drawings for selected compartment areas, as well as the extraction of all production data. The tool offers possibilities for flexible data extraction: user definable views in drawing, possibility to present pipe as it will be located on assembly table and data for manufacturing can be presented in a most suitable way to meet requirements of workshops. Additional checks for production prevent issues related to the manufacturability of pipes and provide possibility to add field weld information and extra length if required. It is possible to bind equipment objects to the compartment where the object is located. This allows location changes to be detected and visualized, so that objects can be moved to their bound location again. The tool offers possibility to see changes in either equipment positions relative to compartments these are bind to, or moving objects to their bound location in a compartment if either the compartment or the object has been moved from the bound coordinates. The 3D direction disk provides users with visual navigation while defining directions. The direction of branches, bends, and elbows are now easy to see and simple to select for standard angles, such as 30, 45, 60, 90 etc. Defining directions is often difficult in the 3D space. With the 3D disk, the software assists the user to select from standard angles or to visually check the required direction and input the exact value. Measuring distances has never been more straightforward – the measured values pop up on top of the 3D model. Measurements in the 3D model. With the Export to Mars2000 feature, it is possible to export data from CADMATIC Hull frame views to an XML file, which can then imported into Mars2000 and used for scantling analysis. The exported XML file contains the description of the inner construction and its distribution in the ship, translated for Mars2000. The purpose of this feature is to provide a means to ensure the conformity of the ship design done in CADMATIC Hull with the Bureau Veritas Rules for the Classification of Ships and IACS Common Structural Rules for Bulk Carriers and Tankers. Conoship International, SARC and CADMATIC joined forces to develop a collaborative ship design system. The 24-month project, which ran from 2016 to 2017, was titled CPDES (Collaborative Platform for the Design and Engineering of Ships). The development of the first project phase was supported by the Dutch “MKB Innovatiestimulering Regio & Topsectoren” program. CPDES aimed to create a collaborative software infrastructure that accelerates ship design. With a focus on bulkheads & decks, compartments and piping, CPDES aimed to create a V1.0 implementation, which covers intensively used data and actions, as well as a comprehensive manual and other instructional materials. Time-consuming design data exchanges and managing the consistency of design data are designers’ main challenges. Therefore, uniform, modern data exchange interfaces between early design software tools and steel design software tools are very beneficial, which is exactly what CPDES aimed to achieve. In the early design stage, most small and medium-sized shipyards and design offices have difficulty controlling consistency when exchanging a ship’s arrangement and hull data between the 2D General Arrangement (G.A.) plan and stability analysis tools. The exchange of design data is often done manually and it can take days to implement design changes like repositioning decks or bulkheads in the G.A. plan and analyzing the effects on the various design calculation applications. Performing damage stability calculations very late in the basic design process, for example, often involves a lot of rework and results in increased building costs if the design does not fulfill the requirements. Based on feedback from our clients, we have improved the elongation reports. In our example project, you will find examples that can help to define your own definitions. It is now possible to add an elongation table to the excel layout. The elongation values are an average elongation at each template location. The number of elongation values per template can be set. In this example, five positions are defined. The elongation direction is perpendicular to the template. The system collects the elongation values from an elliptic area and calculate the average. When welding two plates together, shrinkage can lead to deformation. The primary purpose of the new deformation attribute is to enlarge the plate on one side so that the deformation will be neutralized after welding. Deformation attribute for weld compensation. More data is visible - object identifiers for 3D objects in eBrowser and eShare. Now it is possible to get even more information from navigating 3D models in eBrowser and eShare without the need for additional clicks. 3D object identifiers are customizable with 3D labels and position IDs, key attributes or other data. The labels are displayed on top of the 3D model view and are always aligned with the model and move with objects. Any attribute can be displayed on top of the 3D models, such as position IDs, system names, pipelines etc. Labels will appear during the navigation and zoom in or out. The labels will be visible also in snapshots taken from the model and can be utilized to complement data for the construction site. Enrich 3D view with more data without the need to check it from individual objects. Version 2019T1 allows point clouds to be added to the eShare server. Currently, the supported format is CPD, originating from the CADMATIC Laser Scan Modeller. In eShare, point clouds are automatically converted to photo panoramic images, which can be transferred from the server to the user quickly when opened. Adding tags with smart points to equipment and point clouds provides the possibility to easily find it in the 3D model and check any integrated information for it from other linked systems, such as maintenance or operation controls and instructions. Add notes and comments to the points cloud with the smart points feature. The user can open documents in DGN format in eShare the same way as DWG and DXF format documents. The new "Show documents inside ZIP files" option enables viewing documents that are stored in ZIP files. Only one document is listed from each ZIP file, using the preference order .dgn,.dwg,.dfx,.pdf. In addition, the administrator can select which file types are listed. Create markups in eGo to add notes, dimensions, and labels to 3D views of the model and compliment it with a picture taken on site. Taking eGo on inspection trips or to a construction site or production workshop now adds the possibility to share pictures with engineering or asset management by syncing data between eGo and eShare. Editing markup in eGo - add comments and annotations for 3D views. Sync markups between eGo and eShare to send data from the field to design or engineering office.